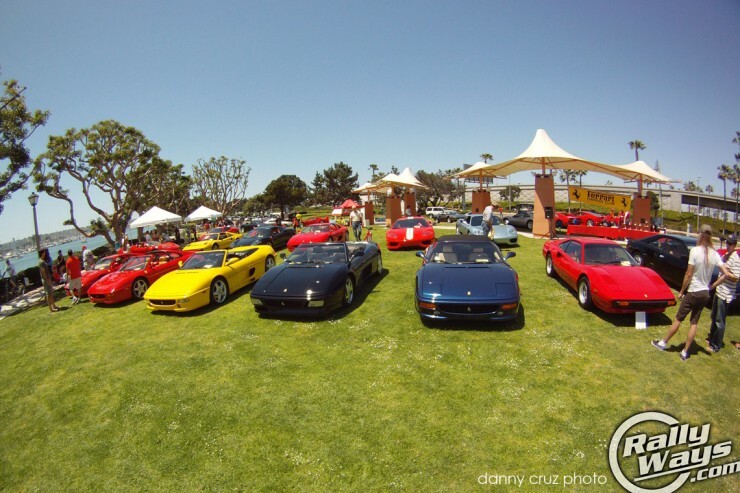 The Bella Italia Car Show in San Diego is a celebration of the Italian automobile. Like pasta primavera, it is hard to argue against the fact that the Italians have built the most flavorful of sports cars. 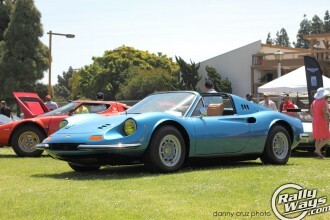 The Bella Italia Mickey Miller Memorial features concours level Italian classics and modern exotic cars. 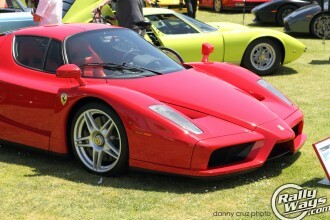 The show has a large showing of Ferrari, Lamborghini and Maserati automobiles. There is also presence of unique vehicles from Lancia, Fiat and Alfa Romeo. Of course, not Italian… French-German if you want to be exact, but there was presence of pre-VW classic Bugatti as well as the venerable German Veyron which cannot be faulted for crashing an Italian car party. There Mr. Bugatti, have some pasta. The show takes place in the very nice Spanish Landing Park on the waterfront of San Diego Bay near the Sheraton Hotel and Marina and across from the San Diego Airport. The setting is pretty astonishing. 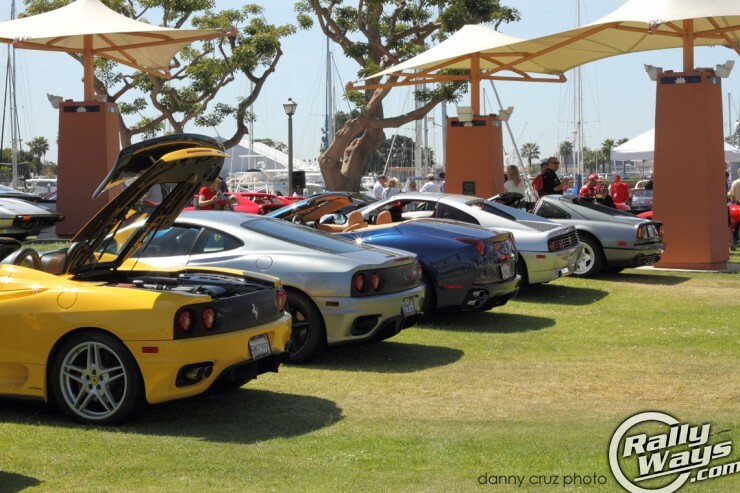 Having an exotic car show besides the water, near a yacht marina, only adds to the already dramatic vibe. Weather was absolutely beautiful for the mostly classic and exotic auto show. You’ve probably figured it out, but water and exotic classic cars don’t play well together. These cars are like trained house cats that usually never leave the house and most definitely never get wet. While late April is not officially time for May-Grays, we can only hope the weather is as absolutely beautiful for the 2014 Bella Italia. It is not prime rain weather, so the chances of a great show are always very good this time of year. The showing was quite stunning. 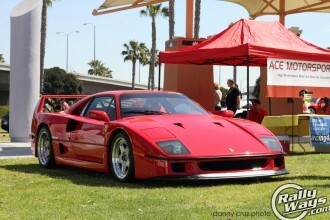 Apart from the obvious standouts Ferrari F40 and Ferrari Enzo, there were other very special cars on the grounds. A friend told me the showing wasn’t as strong as other years, but for someone who is attending the Bella Italia for the very first time I could not ask for more. 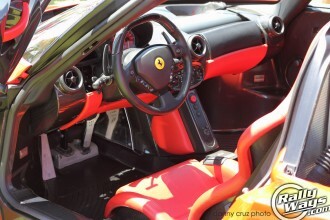 Well, maybe for a shotgun ride in one of the Ferrari 360 Challenge Stradale’s present. Otherwise, a good drive in a Lamborghini Gallardo would be just as fun. Local representation of exotic car dealers, restoration shops and services was quite strong. 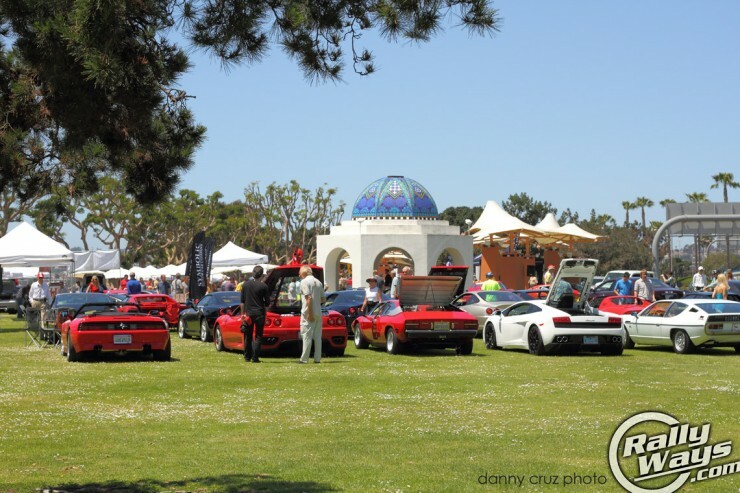 Some locals displaying cars on the show grounds included Symbolic Motor Car Company, Cavallo Motorsports, Ferrari and Maserati of San Diego and La Jolla Audio among others. Symbolic was gracious enough to bring their red Bugatti to mingle with the Italians. Yay for that, because that car looks just as amazing basking on the grass as it does speeding past 250 MPH. 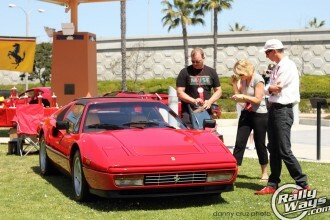 The Ferrari showing representing the Ferrari Owner’s Club San Diego Region was very thorough. Early V8’s were aplenty with 308 Quattrovalvole and 328 GTS models dominating the field. Modern V8’s were strong as well with a wide variety of Ferrari 458 Italia, Ferrari F430 Scuderia and Ferrari 360’s on the grounds. Classic V12’s were not far off either. The Bella Italia had more Ferrari Testarossa representation than any other show I have attended. Of course, the very pretty Ferrari California was there in various shades of awesome. 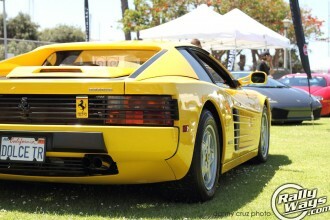 The F355 Berlinetta was there too in all kinds of Skittles colors. Lamborghinis were aplenty as well. 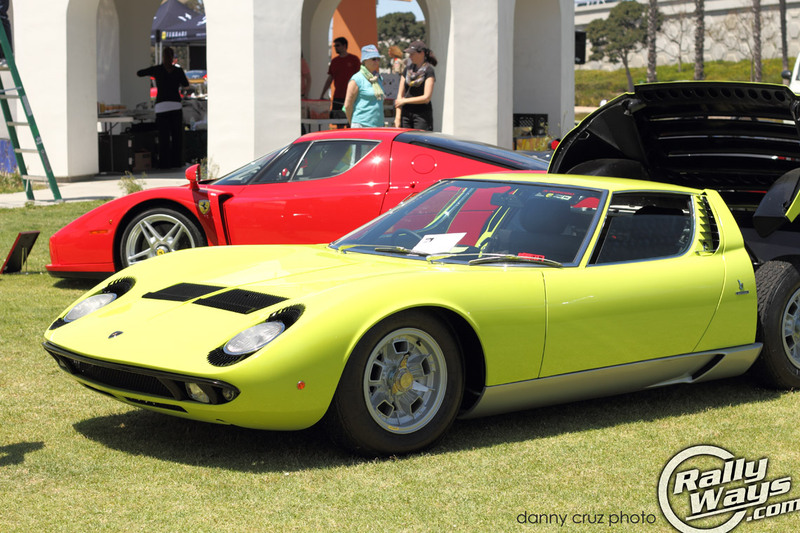 Maybe not as strong a showing as Ferrari, but the lime green Miura was testament that Lambo was to be noticed. Other rare Lamborghinis from the classic days included an Uraco and a Lamborghini Espada. 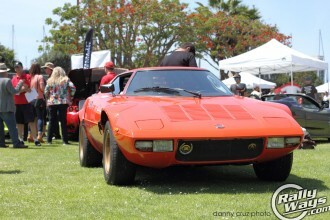 Modern showing included a variety of Gallardos. Unfortunately, there was no Murcielago that I could see and there was only one Lamborghini Aventador. 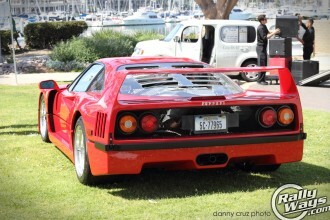 A showing of a Countach beside the Ferrari F40 would have scaled the show from great to amazing. Let’s hope for a Countach at the Bella Italia 2014 again happening at the same place on San Diego Bay. Now, plugging in RallyWays partial cars… admittedly the Lancia Stratos and “Chairs and Flares” blue Ferrari Dino GT make us jelly at the knees. 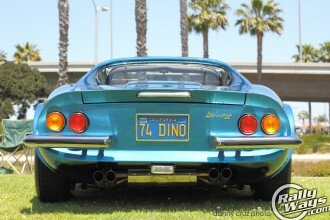 It was also great to see a regular width Dino with a very nice patina of a great classic driver’s car. Same goes for the Stratos… it had the great look of a loved-classic rather than the more pristinely clean concours style of show car. A number of neat Alfa Romeos Spyders was also very nice to see. 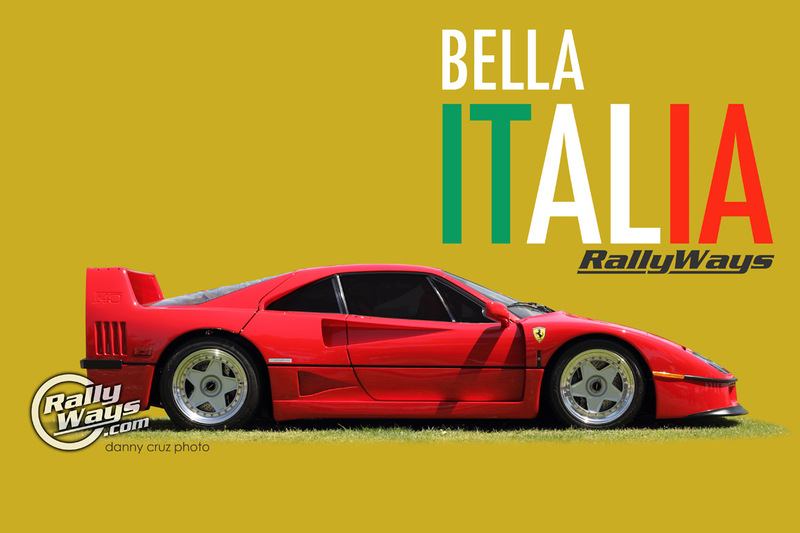 RallyWays is looking forward to attending the 2014 Bella Italia Car Show given the fun experience this year. We’ll be there earlier next time to catch the cars coming in and land better photography lighting. There is a lot going on in SoCal on any given sunny weekend. Not to mention, every month there are plenty of Car Shows in San Diego, but attending the 2014 Bella Italia Car Show next year should be at the top of your list. It is something very special.